What’s the Deal with Ghee? In Ayurveda, ghee, a form of clarified butter, is commonly used in diet recommendations as well as treatments. It is a nutritionally packed oil with many health benefits. Ghee, unlike other oils contains Butyric acid which is the primary fuel for the cells of the colon. This acid helps to repair our intestinal walls and boost our immune system, so it is beneficial to aid our body in keeping the levels up. 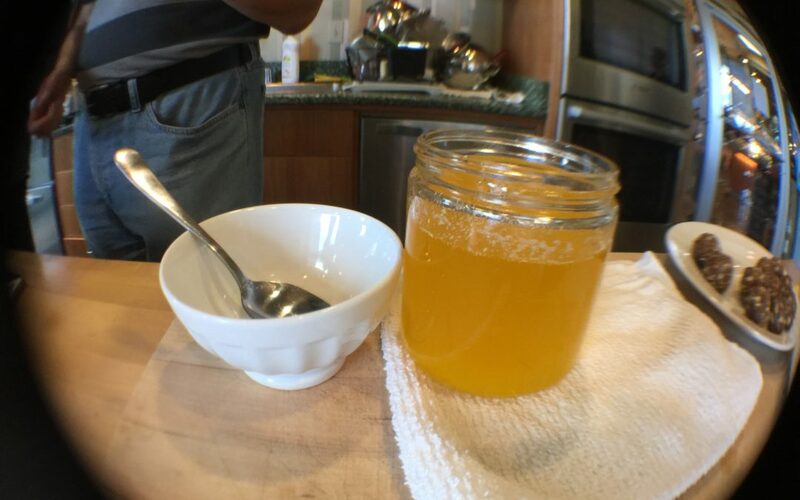 Ghee is also loaded with heart, brain and skin-healthy Omega-3 and Omega-9 essential fatty acids, along with all the fat-soluble vitamins A, D, E, and K, minerals and at least nine phenolic antioxidants. Remember to put a dollop on your food, especially during these dryer months. Consuming healthy fats is very important for brain function, digestion, increased absorption, and overall health. Put the butter in the sauce pan over medium heat and stir periodically with the metal spoon. When the butter has melted and begins coming to a boil reduce the heat to low. You want the liquid to continue to simmer with small bubbles. From the milk solids a foam will develop on top and will eventually sink to the bottom. Continue to stir every few minutes until all the foam has gone to the bottom and there is golden ghee on top. This should take about 15 minutes. Remove from the heat and let it sit for an additional 15 minutes. Place a piece of cheese cloth over a small strainer set it over the glass jar. Then gently pour the ghee through the cheese cloth and strainer into the jar. Make sure none of the milk solids make it into the jar. Cover the jar and let it cool overnight. Ghee can be stored at room temperature for a month or two and for 2 to 4 months in the refrigerator without going bad. Enjoy!